On the latest Motif++ 1.0.6, we have introduced a very primitve Model-View update model on View class. By using the model, we can easily write a mixed program of an OZ++ Thread class and Motif++ GUI classes. Please note that the libraries of Open Motif 2.1 (and later) are thread-safe(See: Open Motif Overview). 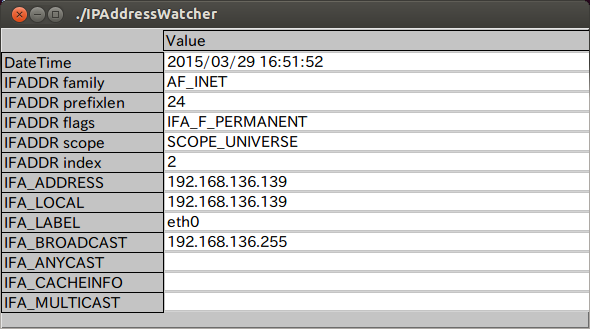 The following IPAddressWatcher program is an example to display some IPAddress information retrieved by IPAddressWatcher thread on TableView. This sample program is built on two classes IPAddressWatcher(Thread), and MainView(ApplicationView). 3. Get a propertyList corresponding to the IPAddress information. 4, Call updateModel method of the MainView with the propertyList. 5. Return 2 procedure to receive more information. 1. Update the model variable of MainView by the propertyList passed from IPAddressWatcher. 2. Call updateView method of MainView after the model update operation. 3. Update all items of the first column of the table by the updated model variable. // Call flush to update items of the table immediately.